Do you want a unique and personal wedding band? 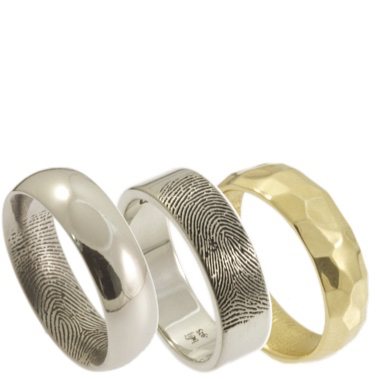 Brent & Jess will customize your wedding bands with fingerprints, hand/footprints, symbols (including heart, cross, anchor, equal partner, etc. ), personal messages, initials, jewels, and modern lines and designs. You can construct your band to look modern with organic edges, or especially unique with an olive branch design coupled with your partner's fingerprint. Brent & Jess works in platinum, palladium, rose gold, white gold, yellow gold, and sterling silver. 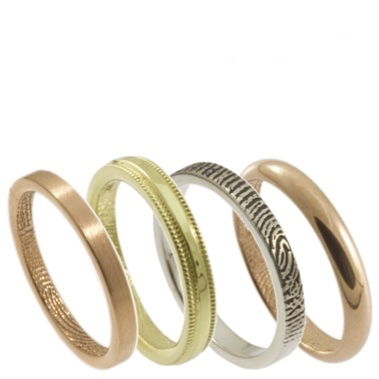 Each ring is customized and personalized to you through a personal consult!